A west Cornwall chapel has won a place in the final of the BBC Two programme Restoration Villages. 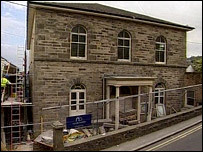 The Newlyn Trinity Methodist Chapel beat two other projects in the South West, the Rope Walk in West Coker in Somerset, and Welcombe Barton in Devon. The chapel was used for religious worship until eight years ago, when structural problems were identified. Villagers wanted to create a centre celebrating their religious, social, industrial and artistic heritage. Organiser The Rev Julyan Drew said: "We're absolutely delighted. It's wonderful news for Newlyn. "I think Newlyn is held dear to lots of people hearts. This is also a real community project. "It's not just about restoring a building, its about saving the heritage of Newlyn." This year the Heritage Lottery Fund (HLF) has set aside £1.9m to help restore the finalists. Nerys Watts, HLF manager for the South West, said: "Newlyn Trinity Methodist Chapel is a heritage gem at the very heart of the community and we're delighted it has gone through to the final." The Grade II building is one of the best and most complete early 19th Century chapels in Cornwall. Built in 1835, it is an emblematic building as Methodism has played a key role in Cornish working and social life for over 200 years. Despite its current structural problems, it retains its horseshoe gallery and original box pews. The original pulpit has been incorporated into its present rostrum.